Nick Jonas and Priyanka Chopra can't stop, won't stop saying "I do." After returning from their Caribbean honeymoon, the newlyweds had their fourth wedding reception at the Jonas family's restaurant, Nellie's Southern Kitchen, in North Carolina on Sunday. According to E! 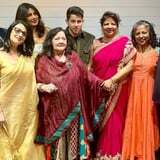 News, there was lots of music, dancing, and great food, as well as a sign inside that read, "Nick and Priyanka just got hitched but that knot that they tied has not been dipped in gravy or honey or hot chicken grease. So it's time we throw them a Nellie's Southern feast. Mama and Papa J invite you with pride to come celebrate their boy and his bride." The following day, Priyanka posted a shot from the lovely affair on Instagram featuring her mom, Madhu, and Nick's parents, Denise and Kevin Sr. "Fam jam. Thank you @nelliessouthernkitchen @mamadjonas @papakjonas for a wonderful reception!" she captioned it. "We love you! This was amazing." Nick and Priyanka's relationship may have begun as a friendship, but things turned romantic when they started dating in May 2018. Two months later, Nick popped the question during Priyanka's 36th birthday celebration, and this past December, they wed in a series of ceremonies in India. This marks the couple's fourth wedding celebration, but at this rate, it's still unclear if it will be their last. Congrats again to Nick and Priyanka!